Summary: Fully Explained Photos and Wiring Diagrams for Bedroom Electrical Wiring with Code Requirements for most new or remodel projects*. Code requirements and energy efficient specifications now incorporate the following methods into a new or remodeled bedroom project. All lighting must be on either: on dimmer switches, or provide a "manual-on occupancy sensor" or all fluorescent lighting. Closets less than 70 sq. ft. are exempt from the above lighting requirements. Incandescent lights in clothes closets need a 12 inch minimum clearance from combustibles such as walls or the edge of shelf, measured horizontally. 6" horizontal clearance is allowed for recessed incandescent lights with covers or fluorescent fixtures. Permanently installed hardwired Smoke Detectors with battery backup are required in all occupied bedrooms, and in the hallway area just outside the bedroom doors. Arc Fault or AFCI is required for all bedroom outlet or receptacle circuits. Bedrooms may require tamper proof outlets or receptacles. These outlets prevent children from accessing the electrical components. Ceiling Fans may be installed where there is a minimum of 7 feet clearance from the floor to the fan blades. Incandescent lights in clothes closets need a 12 inch minimum from combustibles such as walls or the edge of shelf, measured horizontally. 6" horizontal clearance is allowed for recessed incandescent lights with covers or fluorescent fixtures. Dimmer switches may be required as an energy savings and efficiency control for lighting. Be sure that the dimmer switches and light fixture types are compatible. All bedroom outlets, ceiling fans, lights and smoke detectors shall be on AFCI Arc-fault protected circuits. A permanently wired smoke detector is required in each bedroom and on the ceiling or wall at a point centrally located in the area giving access to bedrooms. (see more about the installation of Smoke Detectors). 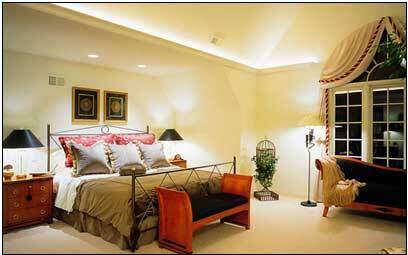 Add a romantic touch to your bedroom by simply installing accent lighting controlled by mood enhancing dimmer switches. Additional lighting fixtures, carefully placed, will assist you while you read your favorite novel just before dozing off to sleep, or become the warm touch that invites a romantic evening. Candles are a nice touch, but when it comes to new lighting features and controls you won't believe just how much control do you will have from the push of a button. Be sure to add these features into your electrical wiring diagrams. Proper placement of receptacles will eliminate the need for unsightly and unsafe extension cords as you examine your bed wall with regard to the placement of receptacles for items such as electric blankets, alarm clocks, and your favorite source of music. Other considerations for your home electrical wiring for bedrooms would be nightstand lighting which could be controlled by what are known as half-hot switched receptacles. These receptacles conveniently allow you to control your nightstand light from either the wall switch as you enter your bedroom or within hands reach from your bedside. Don't forget the importance of telephone and wall jacks as well as cable TV provisions. The newly required AFCI (arc fault circuit interruption) devices reduce the possibility of fire and other hazards. New construction and remodel projects will require the addition of this AFCI protection. Improvements in wireless control technology will help you rest easier knowing that lighting controls are at your fingertips, with a remote controlled system which can be placed on your nightstand ready for your use anytime of the day or night. Improvements in ceiling fans affordably provide a variety of styles that not only cool in the summer but also warm in the winter by using easy to operate remote control units. Light and fan combination units will also provide a mood enhancing touch to your bedroom so be sure to add these options to your bedroom electrical wiring diagrams. Great air flow for winter or summer. Interconnected protection throughout the home. Circuit safety and arc protection. I Lost power for a small bedroom. I replaced the circuit breaker and still have no power. Short of it being another bad breaker, what else could be causing the problem? William, there is most likely a lost connection that has occurred with one of the conductors of the bedroom circuit. The circuit wiring, connections and outlet devices will all need to be inspected for a burnt or bad connection. Once the problem has been identified then the proper repairs will be necessary. Jon, Since the power source of both the hot and the neutral is located at the wall switch box of the bedroom, then just replace the connections that go from the switch to the outlet with the new black wire that goes to the ceiling fixture, and connect the wire that used to go to the outlet together with the black of the incoming power. The white neutral wire of the ceiling fixture connects with the other neutral wires in the switch box. The single switch box can be changed to a double gang switch box if and additional switch will be required. Test and make sure the circuit power is off before doing any wiring. Mark, Electrical outlets require a circuit consisting of a power feed, neutral, and a ground, which is typically accomplished by installing a cable with wires that are black, white and bare copper respectively. For this application, the power source would enter at the switch location which would be wired to control only the power feed or black wire of the incoming power source, and the black wire of the outgoing cable leading to the outlets. The white neutral wires and the ground wires are spliced through at the switch location and the outlets are wired parallel from the first to the second. What is the best way to add wiring for additional Bedroom Lights? I would like to install eight 4-inch recessed light fixtures in my master bedroom. Currently I just have a ceiling fan with a light fixture in it. The ceiling fan is controlled by two switches, and operates by a remote. I believe the switches have red and black wires. I want to replace the ceiling fan with a chandelier and use one of the black or red wires for powering the eight recessed lights. Which wire should I use to power the recessed lights? I would like to replace the regular switch with a dimmer. Also in the attic where I will be installing the recessed cans there are existing wires running in the location of the new light fixtures. How far should I move the existing wires from the recessed cans? Since there are two existing switches for the ceiling fan and light, the wiring may be adapted for the additional recessed lights and the chandelier, you would just need to keep track of the switch assignments so the dimmer switch will be installed with the right set of wires. The existing wiring in the attic should not come into contact with the new recessed lighting fixture enclosures. IMPORTANT: When adding an additional load to an existing circuit the circuit should be tested to make sure it has the capacity for the additional calculated load to prevent overloading the existing circuit.